It’s almost unfair to judge the Kill Bill movies as two separate entities because they really need each other to offer the full effect. But they were split up, and so they shall be evaluated. I personally prefer the more dialogue-heavy second volume and would probably call it my favorite Quentin Tarantino flick. It’s basically the director plunging headfirst into homages of all his favorite movie genres, even more so than usual. This is stylish and intense, just ever so slightly over the top. The climactic confrontation between Uma Thurman‘s Bride and David Carradine‘s Bill had me on the edge of my seat. “60% of the time, it works every time.” “I don’t know how to put this but I’m kind of a big deal.” “I’m in a glass case of emotion!” “Milk was a bad choice!” “I love lamp.” “Whammy!” I could do this all day. A hilarious comedy with so much good material that they were able to make a passable secondary film just from what was left on the cutting room floor (Wake Up, Ron Burgundy: The Lost Movie). A concept like the one in this film (guy decides to erase all memories of his ex but changes his mind midway through the process) could quickly turn overly gimmicky. Here it doesn’t, however. Sure, Michel Gondry plays it for all its worth, with a non-chronological structure and plenty of dreamlike sequences as we traverse a man’s mindscape. But underneath it all lies a strong and poignant story about a romantic relationship and the ways it changes with time. The movie is also notable for having both Jim Carrey and Kate Winslet play against type (and expertly so): Carrey as the unfunny and timid Joel, and Winslet as wild and spontaneous Clementine. Had Glengarry Glen Ross been about relationships rather than business, it would probably have turned out something like Closer. As the four principal characters (Jude Law, Natalie Portman, Julia Roberts and the stand-out Clive Owen) drift in an out of love with one another and battle with the importance of truth, we’re treated to the movie’s greatest strength: the dialogue, so wonderful that the film would probably play just as well in audio form. 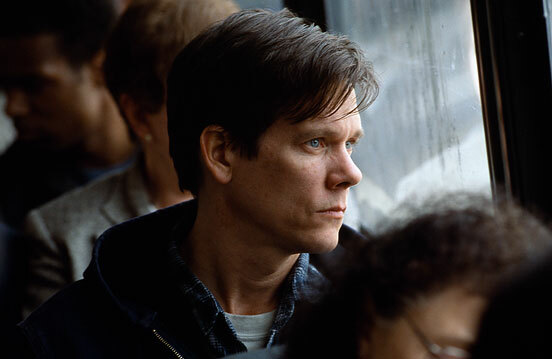 For a long time, I had a somewhat irrational dislike for Kevin Bacon as an actor. Something about him just irked me. This film changed all that in an instant. He puts forth a masterful performance here as Walter, a man just out of prison after serving time for child molestation. He wants to move on with his life and “be normal”, but does not know if he deserves it or if the world will let him. This is one of those films that grabbed my attention right from the start and had me hoping it would stay as great throughout. And it did. The Woodsman is a powerful movie about a tricky subject matter, and it makes no mistakes whatsoever. What starts out as a somewhat typical (if incredibly well-made) sports movie transforms into something much richer and more heartfelt. From one woman fighting adversaries in the ring to one man wrestling with concepts of morals and principles. Clint Eastwood and cinematographer Tom Stern bathe the film in darkness, which makes the moments in the spotlight all the more effective. But it’s the relationships present and forming between the three main players (Eastwood, Hilary Swank and Morgan Freeman) that really make the film shine. As Alexander Payne is currently making waves with his new film The Descendants (which I haven’t seen but very much want to), it seems as good a time as any to remember his 2004 masterpiece Sideways. But I don’t have to specifically remember it. It has never left my thoughts. 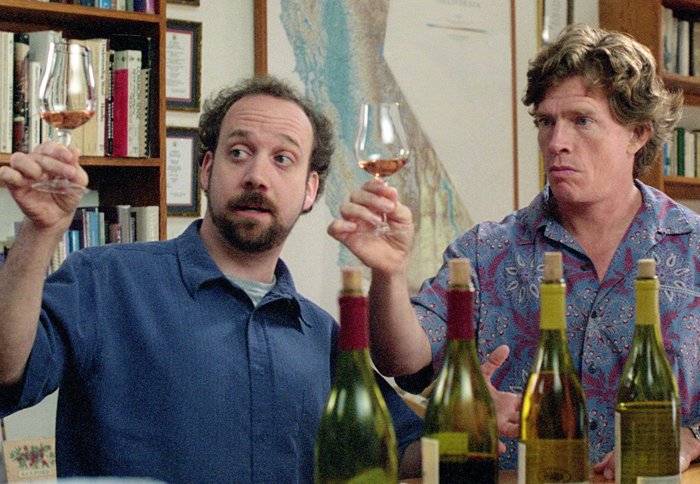 One of those movies that really resonate with me on a personal level, filled with gorgeous views of California’s wine regions and with two teriffic performances by Paul Giamatti and Thomas Haden Church as best buddies Miles and Jack. I really wish I could put this film at #1. It’s that kind of movie. But there’s no denying Before Sunset. Jesse and Celine (Ethan Hawke and Julie Delpy) meet up again, nine years after the events of 1995’s Before Sunrise. Things have changed for both of them, but the more things change, the more they stay the same. Youthful romance has given way to grown-up responsibilities, yet thoughts about what might have been still linger. Like the first film, this is “just” two people talking for the entire movie. But since they’re fascinating people who find each other fascinating too, this never gets remotely close to dull. And since it all transpires in pretty much real time and Jesse has a plane to catch, there’s a sense of urgency to everything we see, and the pay-off at the end is perfect. For my money, there has never been a sequel as great as this one. What are you favorite films of 2004? What do you think of the movies on this list? Haven’t seen a couple of them, but some of them wouldn’t appear in my list like anchorman and Sideways. Totally agree with your number one though! It seems there’s a lot of love for Before Sunset in the world. Wonderful film, truly. Looks about right, but I think the specific rankings are a bit off. Christmas with the Kranks isn’t a particularly special movie, but I’ve come to enjoy watching it each Christmas season so it gets a pass for sentimental attachment. I enjoy your lists. There’s always stuff on there to surprise me. Shaun of the Dead I liked, but not as much as the rest of the world, it seems. I found Hot Fuzz a better effort overall, with clearer focus and more cleverness. Haven’t seen anything from 4 and downwards. Harold & Kumar I should give a go, just to see if it’s my cup of tea humor-wise. The Life of Aquatic also intrigues, especially since I recently found a Wes Anderson film I really enjoyed in Rushmore (I was a bit more tepid towards Royal Tenenbaums and Darjeeling Limited). Hotel Rwanda as well is on my watch list. Plenty of people have recommended it to me. I also like how After the Sunset is on there, if only because Before Sunset is on my list. There are a few other movies that technically came out in 2003 that I think most of us think of as 2004 releases that I think ought to be on my list, but I can’t think offhand of what they are. At last, a list of films I’ve all seen! There’s only one I disagree with, and that’s CRASH, but your other choices are so superb that I’m forgetting all about that one! So so so glad you picked BEFORE SUNSET as your number one – that is an amazing, amazing film. Yeah, I’m fully prepared that people will have issues with Crash. It seems there’s no middle ground for that film. People either love it or hate it. Fair enough. As always a fun read and even though I have other favorites, I’ve seen them all and can see why you like them for different reasons. 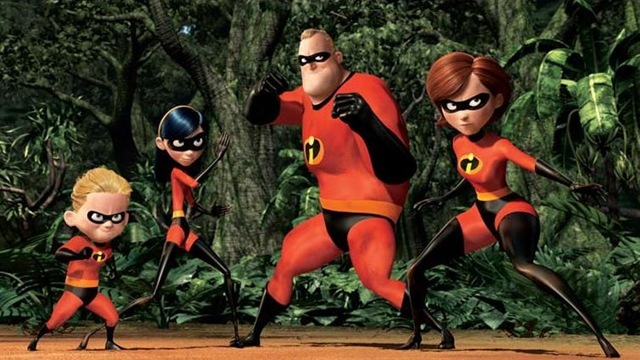 The Incredibles – Agree that this is one of the best Pixar (and animated) movies. Crash – I like it. I re-watched it a few years ago and it worked almost as well. Kill Bill: Vol. 2 – I prefer the first one, feel this one has too much dialogue (which you like). 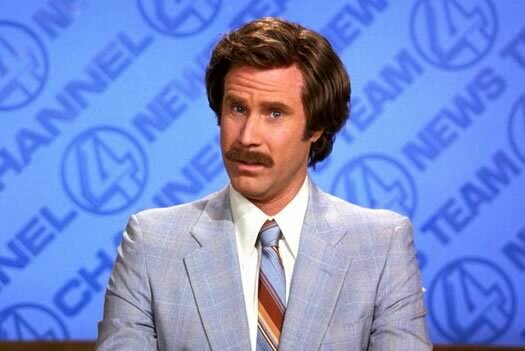 Anchorman – Had some funny moments and dialogue, pretty average comedy. 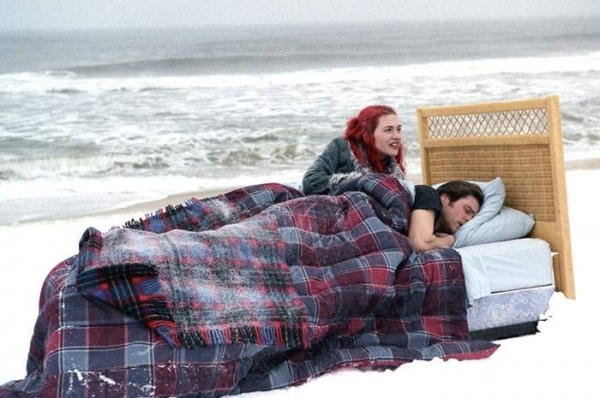 Eternal Sunshine… – Wasn’t too impressed when I saw it, need to see it again though. Closer – Pretty good, but didn’t like Julia Roberts/Jude Law in it. Portman/Owen were good. The Woodsman – Yes, Bacon is excellent and it’s a good drama. Not great, but good. Million Dollar Baby – One of the better movies of the year, heartfelt and well acted. Sideways – Not a favorite, but I liked it. I’d like to watch it again sometime soon. Before Sunset – I actually liked the first one better, felt more natural. But this one was also good. A couple of movies I like from 2004: Collateral, Million Dollar Baby, Crash, A Moment to Remember, The Incredibles, Hotel Rwanda, The Bourne Supremacy, The Notebook, The Machinist, The Butterfly Effect. Some nice picks of your own there. Collateral and The Butterfly Effect are two movies I really like, for very different reasons. The Machinist was good too, but I’d have preferred a less artificial feel from it. The Notebook wasn’t my cup of tea at all. Good acting, but it never moved me. As for the ones I haven’t seen… Hotel Rwanda is on my watch list already. As is Borune Supremacy, but it doesn’t feel as urgent. I liked Bourne Identity just fine, but not enough to make the sequels top-priority or anything. I haven’t heard of A Moment to Remember before, but it sounds very interesting. I would recommend you to watch the three Bourne movies in one day. I’ve seen them a couple of times on their own, but one night I decided to watch them all at once and it was a great experience. They all became better actually so the next time I’ll watch Bourne, I’ll be watching them together. I usually don’t like follow ups, but they really got it right here. A Moment to Remember is one of the better Korean movies I’ve seen, especially in the romantic drama genre which this is. And Hotel Rwanda, well you’ve heard about it already and it’s a must. We’ll see if a Bourna marathon happens sometime. Nothing I’m planning on for now, though. I haven’t no. Heard lots of good things about it. Thanks for reminding me to add it to the queue. Yeah, Oldboy is listed as 2003 on IMDB, so it was never in the running for this list. I agree that it’s a very good movie, though. I wonder how the remake will turn out. Team America definitely had its moments. The opening segment in France was teriffic, for instance. I think it gets way too unfocused in its satire as it progresses, though. It goes from having something to say to just being a mud-flinging impartial spectator. I enjoyed it overall, but it could have been so much more. Solid list, Emil, though half of these won’t be on my list. I never saw Anchorman, and Woodsman and Closer were good, but not great. Incredibles and Crash are very good, but they didn’t quite make the cut. Everything else on your list is just aces. A few you may have missed: Undertow, from David Gordon Green; Vera Drake, from Mike Leigh; Spiderman 2; The Door in the Floor; Bad Santa, and The Aviator. I also don’t want to leave out Birth, The Village and Spanglish, as are all highly underrated. What a great year in films! Thank you for the suggestions, Dave! Always appreciated. Undertow is indeed one that has slipped past me. That one’s going on the rental queue for sure. Vera Drake, Door in the Floor, Birth, Spanglish and The Aviator are already on my watch list. Vera Drake is the one that interests me the most. I’m dreadfully underwatched when it comes to Mike Leigh. I’ve only seen Happy-Go-Lucky, and I really enjoyed that one. I think most of his filmography is on my rental list though, so hopefully that’ll change soon enough. Spider-Man 2 is really good. One of the better superhero films out there. Shame it all fell apart with the third film. Bad Santa was funny, but lacked that certain something to lift it to the next level. And I agree that The Village is somewhat underrated. It’s not great or anything, but it tends to get more hate than it deserves in my book. The part in the woods was really well done. Aye, 2004 was another great film year in a long line of them from the past decade. Yeah, I was slow when it came to Mike Leigh for a long, long time. But when I saw Secrets & Lies a few years ago, that’s when I discovered him. I knew then he was someone special. It’s a life-affirming film, just gorgeous. I didn’t care for Naked, but I did really enjoy Topsy-Turvy and Happy-Go-Lucky as well. Vera Drake is heartbreaking, and his latest – Another Year – is just absolutey delightful. When you catch up with him, you’re in for a nice collection of treats, my friend. I’ve seen “Undertow” and was somewhat dissapointed. It had a lot of potential, but I didn’t like the end product. One of the reasons I didn’t like it was the music which was up and down (mostly down). I really liked the opening credits music, but after that it mostly went downhill (if I remember correctly there were three composers for the movie). I enjoyed his other movie “Snow Angels” (2007) a lot more. And speaking of “Another Year”, I also enjoyed that one. I felt Lesley Manville should’ve won an Oscar for her performance, she was something special in it. Flickchart does have Jean-Pierre Jeunet’s A Very Long Engagement on there at #9, which may well be right, but I really want to rewatch it before I start throwing it on top ten lists. Ha! Funny how things turn out sometime. I do remember you being quite negative towards Crash from your 50 Day Movie Challenge, so that’s not surprising. I haven’t seen Downfall or Harry Potter. Downfall I keep hearing is a good one, so I’m sure I’ll get around to it at some point, even if historical films isn’t really my favorite genre. I haven’t seen any Harry Potter film, so I guess I should just bite the bullet at some point and go through them. Primer: Fun and very impressive in certain ways, though not one that was getting near my list. Good, but not enough. Garden State: Been a long time since I watched this one. I'm surprised I haven't revisited it at some point, as I really liked it and it's my kind of movie. Might well grow further on me on a rewatch. Mean Girls: Liked it just fine. Shaun of the Dead: Funny film, even if the massive love it gets everywhere continues to puzzle me. Cool list! The Incredibles is my fave Pixar too! Need to see Closer and The Woodsman. Just finally watched Before Sunset and I think I’m in the minority that preffered the first! There seems to be a fairly even split between which of the Before films people prefer. I could go either way, but I know I didn’t fully appreciate Sunrise until after I saw Sunset. At least most agree that they’re both good movies. Nice list. I’ve only missed two films here. Sideways & Before Sunset are brilliant, lovely pictures.